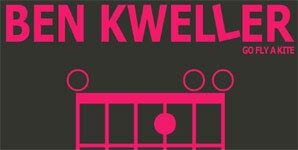 'Go Fly a Kite' is Ben Kweller's 5th album and his first released through his own Noise Company record label. Originally scheduled for a much earlier airing, Ben decided to err on the side of caution; "not to rush it" and "make sure it's just right." The lone star Texan's follow up to 2009's 'Changing Horses' is certainly a polished affair with slick and crisp production and mixing courtesy of Ben himself, and Steve Mazur. ... indeed it does, according to Ben Kweller, the 21 year old music industry veteran who lifted this line from Gregg Araki's 1995 movie Doom Generation to include in the sherbet stomp "Wasted and Ready," the first single off of his debut LP Sha Sha. On plane to LA. Playing the @casbahsandiego on Monday and the @Roxy on Tuesday! @TheRealHoge @benkitterman Haha! Well... he was busy on stage shredding dobro with me. @idenjoshiden @ParadiseRockClb No lie bro! @noahdwood hooked it uppppo!